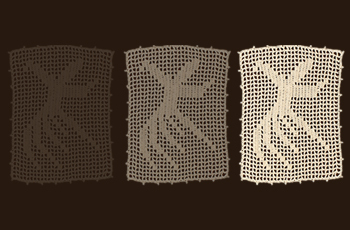 "El-Hay" calligraphy crochet tableau was designed and produced by the artist Cuşan Yenier. EL-HAY is the eternal and absolute life giver. Along with the physical life, God gives the inwardly dead ones the spiritual life (EN’ÂM:122). "Haya" which is the transfiguration of the word "Hay" in humans means "manners". The sense of embarrassment and feeling ashamed is called as "Haya". "Ahiret" (after-life) is the most important manifestation of God's name of "Hay". The real death is not being detached from life, but being detached from reality. Material: white crochet fabric, brown frame. Dimensions: Height 32, width 24 cm.